headus 3D tools :: View topic - unwrapping human head? Posted: Mon Jul 09, 2007 1:38 pm Post subject: unwrapping human head? What's the progress for unwrapping a human head with minimum distortion using UVLayout? I would like to see an example of that. Does a such thing exist? This is beginning to be quite a common request, so I'll put together a video sometime over the next day or two. Yes, sorry about the delay. Yesterday I'd just finished the coding to expand the current 7-sides-per-poly limit up to 256, but then UVLayout crashed in the middle of my head flattening practice run. I'd like to fix that bug first, but the video will be made right after that! Hi, I'm so curious about the 256 sided poly import. Why so many ? Can you show an example in the next point beta upgrade video ? 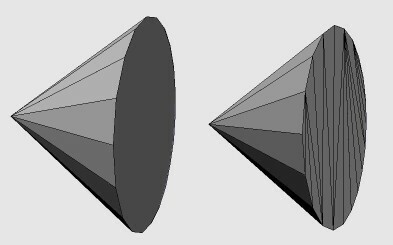 In the current version even a simple cone will be modified (triangulated) when its loaded, and this breaks things like morph targets and the new Maya plugin (it relies on identical topology between objects to copy UVs). I don't expect anyone to get close to the 256 sides limit, but you never know! What you want, and what you currently get. Ah I see now .....after 7 sides UV Layout would triangulate the poly. I always like to know my triangle flow. Its good to know its there if needed. I've just uploaded part 1 of a 2 part head flattening tutorial to the usual download page. I'll put together that second part in another day or two. Thanks, Phil. I must have missed or forgotten the anchor tool .. that was a revelation. I've just uploaded the remainder of that head layout video to the same download page. Thanks man. Going to watch them now! nice, Phil...thanks for some of those handy tricks!